"Floor Rules Week" has been absolutely fascinating, has it not? I have a hard time deciding which of my co-authors' articles I like the best, either The Ferrett's grousing about sideboards in casual play, Flores's "Top 10 All-Time Warnings," or Rosewater's tale of his failed "Tiebreakers Matter" set. For my part, I'll be talking about a subject I've discussed many times before, Magic's various Banned and Restricted Lists. In my "What If?" Week article I asked for feedback from Vintage and Legacy players about what they though could or should change with regard to their formats, and I got my usual giant pile of responses. Mike Turian and I went over them all, made various notes and tallies, read articles by pundits on other sites, and then took the data to the Events Team meeting. The announcement reflecting our decisions went up today; I hope you all agree that this was one of our more productive sessions. The only non-Eternal format in which anything was done was Online Prismatic, wherein Glittering Wish and Summoner's Pact were banned for being powerful tutors, and Detritivore was banned as well, as it falls into the same category as Sundering Titan: a crushingly overpowered card that preys on the nature of the format. After we changed the wording on the card as part of our removal of power-level errata, message boards and independent article sites lit up with discussion of the card, the decks it spawned, and how those decks would ruin—or not ruin—Grand Prix–Columbus. Now that the dust has settled, it's clear to me that the Grand Prix was not ruined—attendance was remarkable, there was a reasonable diversity of decks in the Top 8, and there were plenty of interesting decisions to be made at both the deckbuilding and game play levels—but Flash is so format-defining and environment-warping that it has to go. Basically, I think formats like that are fun for about one event and then something has to be done. The window during which the card was powerful and legal was short but memorable; the spotlight shone brightly on Legacy for a couple weeks and the format and its players proved to be up to the challenge of fighting against an overpowered juggernaut. A good player piloting a uniquely tuned version of the deck did win the event, which was both good and bad I suppose, but a scan of the cards played and strategies employed over the weekend show that Flash's impact was unhealthy for the long term. Mind Over Matter and Replenish are UNBANNED. There are currently cards on the Legacy Banned List that are less powerful than cards that are legal. With a format as large as it is and with so many moving parts, drawing and maintaining the line precisely is an impossible task, but we should do our best to home in on it when we can. To that end, we're pulling some of the less egregious offenders off to see what happens. Mind Over Matter was at its best when combined with Tolarian Academy, Mana Vault, or Grim Monolith, none of which is legal in Legacy. The card also proved its worth in Extended with High Tide—a card which is legal in Legacy—so it wouldn't surprise me if Mind Over Matter manages to sneak into a deck somehow. But at 6 mana, it seems expensive enough to be unwieldy in the current metagame. Replenish often won the game when it was played, either through some combination of Opalescence and Parallax Tide taking out all of an opponent's lands, or with a more direct kill involving Pandemonium and Saproling Burst. None of that is any different in Legacy, and those decks can be reassembled now that the card is legal again. What has changed in recent years is the amount of hate that any given deck can throw at combos, especially those involving the graveyard. Meddling Mage, Leyline of the Void, and Extirpate are all fairly recent additions to the game (more recent than Replenish at the very least) that can take the bite out of elaborate combo machinations. Powerful spells that tutor for a single card are generally restricted in this format, so what about one that tutors for four cards? Seems natural, especially as the card's cousin, Fact or Fiction, also resides on the Restricted List. Gifts Ungiven was, for a long time, used primarily in a deck based around it—"Gifts"—that would control the game long enough to tutor up a suite of win conditions that left the opponent no way out. Recently the card has been creeping into other decks, including Control Slaver and Gro-A-Tog, as its power is undeniable. It should still see play as a one-of. Black Vise, Gush, Mind Twist, and Voltaic Key are UNRESTRICTED. Here's where I expect the format to shake up a bit. As with Legacy, there are cards on the Vintage Restricted List that are less powerful than cards that are allowed as four-ofs, and we should do our best to even out that disparity. Some cards were restricted long ago, and the world has changed in their absence, so it makes sense to bring them back. We feel that the four cards listed here fit those criteria. Black Vise has been restricted since 1997. Ten years. The format has gotten faster, deeper, and less concerned with cards that do mundane things like three damage a turn. Gush has been restricted since 2003, the height of the Psychatog age. Psychatog is no longer the threat it once was. Bringing Gush back may restore some or all of 'Tog's power, but we're of the mind that the format has passed the toothy one by and that Gush is no longer a problem. If you thought Black Vise had it tough, Mind Twist has been restricted or banned in Vintage continuously since 1994, which is almost as long as the Restricted List has existed. That's as long as I've played the game and longer than a vast majority of my readers have played. Even with Dark Ritual and Mana Drain still in the format, the one copy of Mind Twist that is allowable just isn't a factor in competitive play, so we imagine the harm that could come from allowing three more copies in decks is minimal. 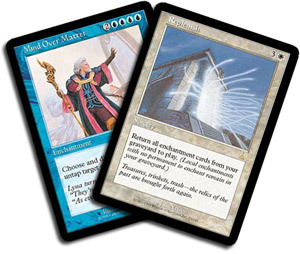 Voltaic Key has been restricted since 1999, when it was given the axe along with many other Urza's block cards as part of the somewhat-overdone Great Academy Purge. The key combo pieces with the Key—Tolarian Academy, Mana Vault, and Grim Monolith—are all restricted, making the potential upside of the card quite low. Will one of these cards cause enough problems to warrant a re-restricting? Possibly, but we certainly hope not. We don't enjoy continuously fidgeting with the lists, as it takes time for all the changes to filter their way down through all levels of the community. But if something breaks, we'll be sure to fix it. And if nothing does, we'll keep looking for things to take off the lists with the goal of having them be as short as possible. *This paragraph is a total fabrication. Which of these offbeat Future Sight rares is your favorite?